P. M. Ohmeis & Co.
Peter Ohmeis, Wines, first appeared in New York city directories at 150 Fulton St. in 1870. The founder, Peter Marcellus Ohmeis (1845-1928), was described as follows in his obituary in the New York Herald Tribune, 24 Dec. 1928, pg. 7, "Peter M. Ohmeis, eighty-three years old, was the proprietor of a restaurant in Fulton Street, between Broadway and Church Streets, for fifty-six years until he retired three years ago, died Saturday of pneumonia at 57 East 123d Street. Mr. Ohmeis was a descendant of a long line of restaurant keepers. He retired because of his age and because prohibition had reduced his profits. Mr. Ohmeis came here from Germany sixty-six years ago and moved to Harlem sixteen years later, continuing to live there until he died at the home of his daughter, Mrs. Cecelia M. Eckstein, at 57 East 123d Street. When he started in the restaurant business he bought the best turkeys for 25 cents each. He described his career when he retired as 'from roast beef at 25 cents to roast beef at 90 cents.' For years he was an agent for the Schlitz Milwaukee Brewing Company. He opposed prohibition and said not long ago, 'I think the average business man still has a good digestion, but prohibition is hurting it. Men eat faster now. They used to take time to talk over a glass of beer.' Funeral services will be conducted at his home at 2 o'clock this afternoon. Burial will be private. His daughter and a son, John Ohmeis, survive." A menu from the P. M. Ohmeis restaurant at 140 Fulton St. is available on the New York Public Library's Digital Collections. The menu is dated Friday, Aug. 24th, 1906, and the printed portion says, "Copyright 1895 by P. M. Ohmeis & Co." The cover locates Ohmeis "retail departments" (restaurants) at 140 Fulton St. and at the corner of Tremont and Boston Avenues, West Farms (the Bronx). It also locates "wholesale departments" at 538-540 Greenwich St., 517-519 Washington St. and 488-492 East 134th St. These wholesale departments were the other side of the Ohmeis restaurants: importer, bottler and beer distributor. The same menu cover lists P. M. Ohmeis as sole agent for Schlitz Milwaukee Beer, Pschorr Bräu Munich Beer, Dreher's Michelob Pilsener Beer, and Imported Kaiser Water. During the years 1911 to 1912 Ohmeis ran frequent ads in the New York Times for Schlitz Beer, for whom they served as distributor in the New York metropolitan area. An even earlier ad is this one from 1902. Interested parties were directed to call Ohmeis & Co. at telephone number 873 Spring. 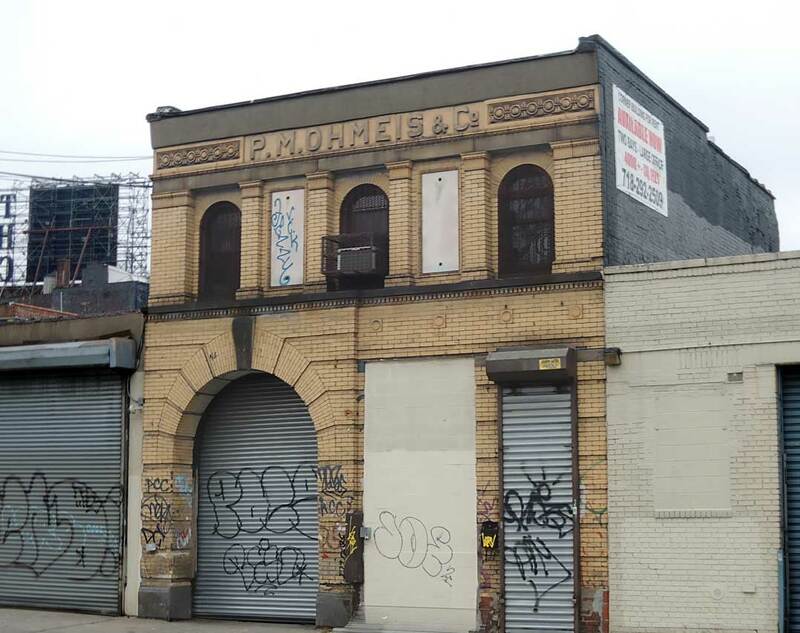 The building here on East 134th Street seems to have been used by P. M. Ohmeis as a stable beginning around 1908. Ohmeis had an earlier facility further east on 134th St. (488 E. 134th St.) connected with the business as bottlers. This was listed in directories in 1893. In the New York telephone directory 488 E. 134th was identified as a stable. In 1908 the address changed to 256 E. 134th St., and this continued to be the case through 1920. From 1921 through 1929 256 E. 134th St. was identified as P. M. Ohmeis & Co., Beverages. From 1930 through 1934 the identification changed to P. M. Ohmeis & Co., Magnesia. Yet this ad from 1933 indicates Ohmeis still survived as a beer distributor. The business seems to have closed after 1934. In 1936 the Beverwyck Breweries, Inc., ran a classified ad in the New York Times for a bookkeeping machine operator. Their address was 256 East 134th St. In September 1936 a Beverwyck ad in the New York Herald Tribune gave the telephone number for their New York City branch at 256 East 134th St. In 1947 the property was offered "For Sale or Rent / Immediate Possession." The offering measured 75 by 100 feet. Probably this means the property extended east from the present O. M. Ohmeis building into the space now occupied by the one-story structure at 256 E. 134th St. (recently labled M & J) and at 258 E. 134th St. (recently occupied by an auto repair shop). In 1924 P. M. Ohmeis & Co. advertised that their 4-story brick buildng at 538-540 Greenwich St. was for sale. The Ohmeis restaurant on Fulton St. closed around 1924/25. P. M. Ohmeis & Co. was described in the New York 1933-34 city directory as "drug sundries" and was located at 256 E. 134th St. Officers were John Ohmeis, John M. Ohmeis, and Herbert F. Ohmeis. John Ohmeis (1869-1950) was Peter M. Ohmeis's son. John Marcellus Ohmeis (1901-1967) was John Ohmeis's son. And Herbert Frederick Ohmeis (1903-1993) was another of John Ohmeis's sons. John Ohmeis was not only an officer at P. M. Ohmeis & Co. but also president of a glass manufacturng company. His obituary notice in the New York Herald Tribune, 5 April 1950, pg. 22, read, "John Ohmeis, eighty, who after thirty-three years retired in 1934 as president of the Peerless Glass Company, manufacturers of milk bottles and containers, of Long Island City, Queens, died yesterday at his home, 2216 Loring Place, the Bronx. For many years Mr. Ohmeis also operated two Ohmeis Restaurants in New York. Surviving are a daughter, Mrs. Lee Batchelder, and two sons, John M. and Herbert F. Ohmeis." Two others connected with P. M. Ohmeis were Charles A. Ohmeis (1871-1912) and Hugo Henry Ohmeis (1877-1920). Both were sons of Peter M. Ohmeis. Hugo Ohmeis died in a tragic accident, as follows: "Hugo Ohmeis, Vice President of the P. N. [sic] Ohmeis Beverage Company, which operates a restaurant at 140 Fulton Street, and Miss Florence Smith, daughter of F. C. Smith of Sparkill, N. Y., were instantly killed early Saturday evening when a west bound express of the West Shore Railroad struck an automobile in which they were riding at a grade crossing at Tappan, N.Y. ... Ohmeis was reputed to be very wealthy. He was 43 years old and is survived by a wife and a son about a year and a half old. ..." (New York Times, 11 Oct. 1920, pg. 12). Ohmeis as a distribor of Schlitz Beer have left their name on many Schlitz advertisements and other collectibles. See, for instance, this poster from the Library of Congress, published c1888.